#1. This week's number one is an experienced international forward Michael Hicks (196-76, college: Texas A&M-CC, currently plays in Argentina). He could not help San Martin Corrientes (4-4) in their last game. Despite Hicks' very good performance San Martin Corrientes lost 79-90 on the road to the much higher-ranked (#3) Gimnasia. He was the top scorer with 25 points. Hicks also added 3 passes in 33 minutes on the court. But this is still an early stage of the season and everything may happen. It's Hicks' first year with the team. He has individually a very good season with high stats. Hicks averages: 16.3ppg, 4.8rpg, 1.5apg, 2FGP: 41.3%, 3FGP: 38.9% and FT: 86.7% in eight games he played so far. Ex-Toros del Chiriqui David player is currently a member of the Panamanian senior national team. #2. Second place goes to an international power forward Jamaal Levy (206-83, college: Wake Forest, currently plays in Argentina). He was not able to help Bahia Basket in their game against La Union (5-3) in the Argentinian La Liga. Levy scored 9 points and grabbed 12 rebounds. But Bahia Basket was edged 74-73 at home by the much higher-ranked La Union (#8). It was Bahia Basket's fourth consecutive loss in a row. But the season just started, so everything may happen. It's Levy's first year with the team. His overall stats this season are: 9.0ppg, 8.5rpg, 1.3apg, 2.2spg, 2FGP: 48.4%, 3FGP: 33.3%. Levy is in the roster of the Panamanian senior national team. #3. The Panamanian player who performed third best last week abroad was an international guard Eugenio Luzcando (190-95, college: Idaho St., currently plays in Argentina) is a teammate of previously mentioned Jamaal Levy and both played together in the last Argentinian La Liga game. Luzcando. He was not able to secure a victory for Bahia Basket (1-5) in their game against La Union (5-3). Luzcando scored 8 points and added 3 passes in 22 minutes. Bahia Basket was edged 74-73 on their home court in Bahia Blanca by the much higher-ranked (#8) La Union. Luzcando has relatively good stats this year: 10.5ppg, 2.5rpg, 2.0apg, 2.0spg, 2FGP: 42.9% and FT: 75.0% in two games. He has a dual citizenship: Panamanian and Chilean. Despite Luzcando played previously for the Chilean U16 national team, he is currently a member of the Panamanian senior national team. #4. Center Jaime Lloreda (204-80, college: LSU, currently plays in Uruguay) couldn't help one of league's weakest teams Hebraica (1-8) in their last game on Monday. Despite Lloreda's good performance Hebraica was edged 30-29 in a derby game by the second-ranked Malvin. He recorded 14 points and grabbed 6 rebounds. Lloreda's team will play only one more game in the Regular Season. And that game will be critical. This season Lloreda has very high stats. He averages: 19.3ppg, 10.0rpg and 2.3apg. Lloreda is also Panamanian national team player. #5. International point guard Trevor Gaskins (188-89, agency: Pro Sports, college: Louisiana Tech, currently plays in Mexico) couldn't help Abejas (12-16) in their last game. Despite his very good performance the fifth-placed Abejas (12-16) was edged 93-90 in Torreon by the lower-ranked (#5) Laguneros in the South group. Gaskins was the top scorer with 22 points. He also added 5 rebounds and dished 3 assists in 39 minutes. This year Gaskins' overall stats are: 9.4ppg, 2.4rpg and 1.8apg in eight games. He is a naturalized American. Gaskins plays currently for the Panamanian national team. He used to play for Correcaminos de Colon in Panamanian league. #6. 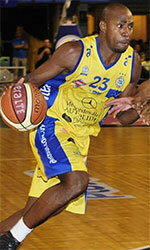 Forward Tony Bishop (201-89, college: Texas St., currently plays in Romania) couldn't help Pitesti in their last game. Despite his very good performance Pitesti (#4) lost 76-82 on the opponent's court to the higher-ranked (#3) Oradea in the Group Red. Bishop was the top scorer with 18 points. He also added 7 rebounds in 26 minutes. It's Bishop's first season with the team. This year Bishop has relatively solid stats: 12.9ppg, 6.4rpg, 1.6apg and 1.1spg in nine games. He is an international player who is currently on the senior Panamanian National Team roster. #7. International forward Akil Mitchell (206-92, college: Virginia, currently plays in France) contributed to an Boulazac Basket's surprising victory against the league leader Cholet Basket (15-1) 92-77 in the French ProA last Saturday. Mitchell recorded 7 points, 5 rebounds and 3 assists. 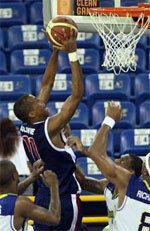 Boulazac Basket Dordogne (8-8) is placed tenth in the ProA. They ended the series of three consecutive loses. Mitchell's total stats this season are: 9.5ppg, 5.9rpg, 2.7apg and 1.5spg. He is a naturalized American. Mitchell is also Panamanian national team player. Strangely he has never played in Panama. #8. Center Javier Carter (203-91, college: S.Alabama, currently plays in Israel) couldn't help Kiryat Motzkin (9-4) in their last game. Despite Carter's very good performance Kiryat Motzkin lost 77-92 on their home court in Kiryat Motzkin to the lower-ranked (#8) Maccabi Raanana. He had a double-double by scoring 31 points and getting 16 rebounds. Carter also added 3 blocks in 36 minutes. Carter has very impressive stats this year: 19.9ppg, 9.0rpg, 1.8apg and 1.1bpg in 13 games. He is a naturalized American. Carter plays currently for the Panamanian national team. He used to play for Caballos de Cocle Aguadulce in Panamanian league. #9. Former international forward Pablo Rivas (198-94, college: N.C.Central, currently plays in Spain) couldn't help Vic (5-12) in their last game on Saturday. Despite his very good performance Vic (#12) was defeated 95-87 on the opponent's court by the higher-ranked Azuqueca (#6) in the East group. Rivas was the top scorer with 19 points. He also added 4 rebounds. Rivas has reliable stats this season: 13.1ppg, 4.4rpg and 1.1bpg. Worth to mention Rivas played also at Eurobasket Summer League, which helped him get the job in pro basketball. He used to play for the Panamanian national team three years ago. #10. Guard CJ Rodriguez (188-94, college: S.Nazarene, currently plays in Argentina) couldn't help Deportivo Viedma (12-6) in their game against Estudiantes Olavarria (12-6) in the Argentinian La Liga Argentina (second division). He recorded 7 points. It was his first game for Deportivo Viedma this season. Deportivo Viedma was badly defeated 102-86 in Olavarria by the second-ranked Estudiantes in the South - South group. It was Deportivo Viedma's first loss after three consecutive victories. Rodriguez is a naturalized American. He is an international player who is currently on the senior Panamanian National Team roster. Rodriguez used to play for Caballos de Cocle Aguadulce in Panamanian league. #1. Doron Lamb (193-G-91, college: Kentucky, currently plays in Greece) could not help Lavrio (4-9) in their last game on Saturday. Despite Lamb's good performance Lavrio was defeated 80-76 on the road by the higher-ranked Ifestos (#8). He recorded 11 points, 4 rebounds and 7 assists. This season Lamb has relatively solid stats: 13.5ppg, 2.2rpg and 2.3apg. He is a naturalized American. Strangely Lamb has never played in Panama. #2. Kaleb Joseph (190-G-95, currently plays college basketball in the States) was not able to help the Creighton in their game against the Marquette University (3-0) in the NCAA. Joseph recorded 9 points and added 3 assists in 15 minutes. Buthis team was edged 106-104 in Milwaukee by the Marquette University. This year Joseph's total stats are: 4.2ppg, 1.1rpg and 1.1apg in 17 games he played so far. He is a naturalized American. Apparently Joseph has never played in Panama.